"Dreams are the only reality." Is there any filmmaker who deserves a valentine more than Federico Fellini? This overview of the career of arguably the greatest Italian film director is less an exhaustive biographical study, and more of a celebration of the man and his movies. At times it feels like one of those extended Oscar night montages; you may find yourself a little at sea if you've never seen any of Fellini's films, but if you have, it's an opportunity to see some brief clips, and hear Fellini's collaborators and biggest fans reminisce about il dirretoro. 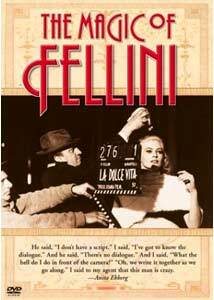 (The documentary was produced in 2001; Fellini died in 1993.) It's also the only disc I know of that features footage from one of the great Fellini films yet to make it to DVD, mired in some sort of copyright confusion: La Dolce Vita. Also on hand are many of the members of Fellini's production team, including De Laurentiis; Tullio Pinelli, a sometime collaborator on Fellini's screenplays; Lina Wertmuller, once Fellini's assistant, prior to her own directing career; and Charlotte Chandler, who wrote I, Fellini, the director's putative autobiography. There are brief celebrations, too, of Mastroianni, Fellini's favorite leading man; of Giuletta Massina, both as a marvelous actress and as Signora Fellini; and of Nino Rota, whose music is inextricable from Fellini's pictures. The hour winds up with some of the director's biggest fans, and those on whom he had a tremendous professional influence: Martin Scorsese, Woody Allen, Roberto Benigni (who seriously needs to switch to decaf), Giuseppe Tornatore. This isn't necessarily the most edifying hour on film history you'll ever watch, but it's surely one of the most joyous. Ciao bello, Federico. Image Transfer Review: There are some resolution problems—Dino De Laurentiis's silk jacket shines like a glowworm—but the clips from Fellini's features look pretty fair, and are all presented in their original aspect ratios. Audio Transfer Review: A fairly clean transfer, from a variety of source material; the music may be a little overemphasized in the mix, but then again, there's nothing wrong with revisiting some of Nino Rota's best work. Extras Review: Nothing but chapter stops. A warm, brief overview to the great man of Italian cinema, this DVD is likely to send you scurrying back to the store for others, to revel still further in Fellini's world.